It is equipped with four control centres, 380 control rooms and 3,671 CCTV systems, which will enable to test airport operations systems equipment prior to their installation. Further, the centre is expected to prepare 400 trainees by 2015 to serve the expanded airports in Muscat and Salalah. The centre has been established by Ultra Electronics Group, which has been the master system integrator for both the airports since 2011. According to Rakesh Sharma, CEO of Ultra Electronics, designing, delivery and installation of the airport operations system is a major part of the work assigned to it. 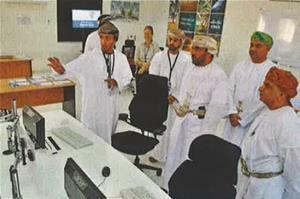 Further, those trained at the centre are expected to work with Oman Airports Management Company after the airport expansion projects are completed. At the inauguration ceremony, Oman Investment Corporation awarded Al-Asr Al-Zahir as the best SME company, an annual award for those working with the company on various airport projects.